Bracketing each end of Broadway Street are across-street banner poles created by Ben Dye. These poles have a custom-built mechanism to raise and lower cables to attach banners, eliminating the need for a lift or ladders. 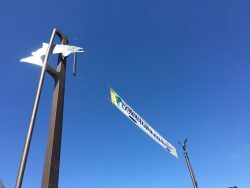 Each pole is graced with Salmon and Osprey sculptures. 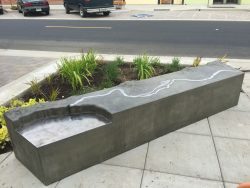 Two fiberglass reinforced concrete benches created by Crystal Schenk and Shelby Davis mimic the topography, dam and Clackamas River and include stainless steel embellishments. 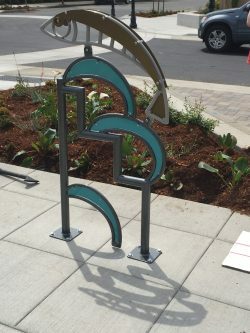 A custom bike rack situated near the farmers’ market carries the bike plaza salmon theme into town. Artists Angelina Marino-Heidel and Joel Heidel were commissioned to expand the amenities for cyclists in the city with the salmon ladder bike rack which compliments their existing artwork in the cycling plaza near City Hall. The City of Estacada Urban Renewal Agency Public Art Selection Committee, in partnership with the Estacada Area Arts Commission and the Clackamas County Arts Alliance, accepted qualifications from artists or artist teams for two (2) Public Art projects along Broadway Street in downtown Estacada. This Call to Artists was the result of a streetscape improvement plan funded through an Urban Renewal District investment and guided by the Estacada Public Art & Amenities Guide. Artists had the opportunity to highlight how Public Art can be incorporated as a placemaking and storytelling tool in the design and revitalization of a community. Downtown Estacada is fully revitalized and well known for being a pedestrian-oriented, accessible and visible downtown where large and small businesses thrive and a mix of new and historic buildings provide a healthy variety of retail choices, services and housing at competitive prices. Residents and visitors alike can spend their shopping dollars in an inclusive, community-oriented setting, complete with an array of attractive features that include an inviting gateway into Downtown, a centralized public plaza and streetscapes with landscaping, art and furnishings that exemplify the spirit of Estacada. In 2014 citizens were invited to participate in a survey and visioning session, providing the foundation for the Broadway Street Public Art and Amenities Guide. This public feedback helped identify and prioritize artwork opportunities for both the immediate construction phase of the street improvements, and beyond. In accordance with the Plan and the Guide, capital investment budgets were established for each of these opportunities. A stakeholder Public Art Selection Committee was formed with representation from local business owners, arts commission, residents, city staff, design engineer and landscape architect. This Committee, in collaboration with the Clackamas County Arts Alliance, provided oversight for artist selection, design review, fabrication and installation of each element.